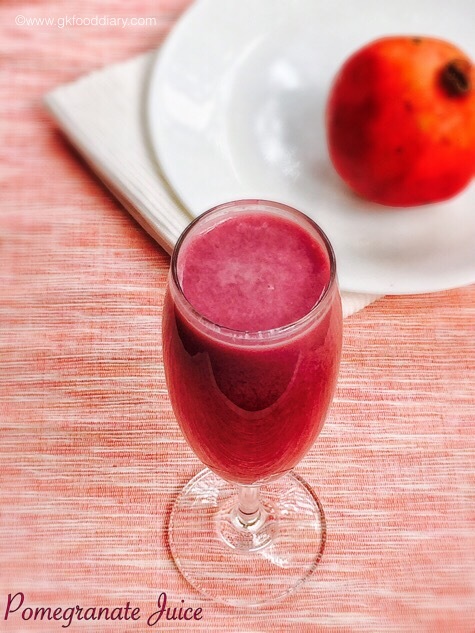 Pomegranate juice - Easy and healthy juice recipe with pomegranate. Here is how to de-seed the pomegranate. Wash the pomegranate in running water thoroughly. Then cut about half an inch from the top and bottom of the pomegranate. Now score the pomegranate 4-6 times around the midline. Don't go so deep but deep enough to touch the skin. Now you can open the fruit using your thumb. It will break into 4-6 pieces easily. Now collect the pearls using your finger. Transfer the collected pomegranate pearls to the blender along with water. Blend it for 10 seconds. Don't grind too long as you might grind the seeds too. Strain through a strainer and collect the juice in a vessel.